It’s no surprise that I love to explore new destinations through food. I learned to bake beside my mother and grandmother, and gathered strawberries, raspberries and asparagus from the garden every summer. For years, I associated the smell of ginger snaps with my grandma’s kitchen. (Eventually, I made them so often, it now reminds me of my own kitchen.) When I had children, we started baking together when my daughters were so small, they had to stand on chairs to reach the counter. So it makes sense that I’d find a kindred spirit in my tour leader on the West Palm Beach Food Tour. 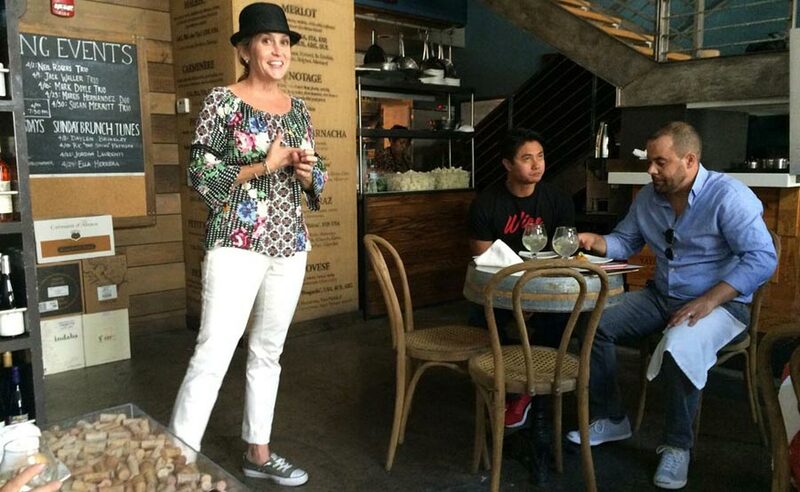 Her ensemble no longer includes suntan pantyhose, but her love of food and talents for entertaining a group of foodies are two of the assets that made the food tour so memorable. As it turns out, even the town has a food story. The Palm Beaches got its name from an 1878 shipwreck, in which the damaged ship had been carrying a load of 20,000 coconuts. A couple of entrepreneurial locals sold them for 2 1/2 cents each, which resulted in a boom of palm trees. We met at Johan’s Joe, and started with coffee, introductions and fika. 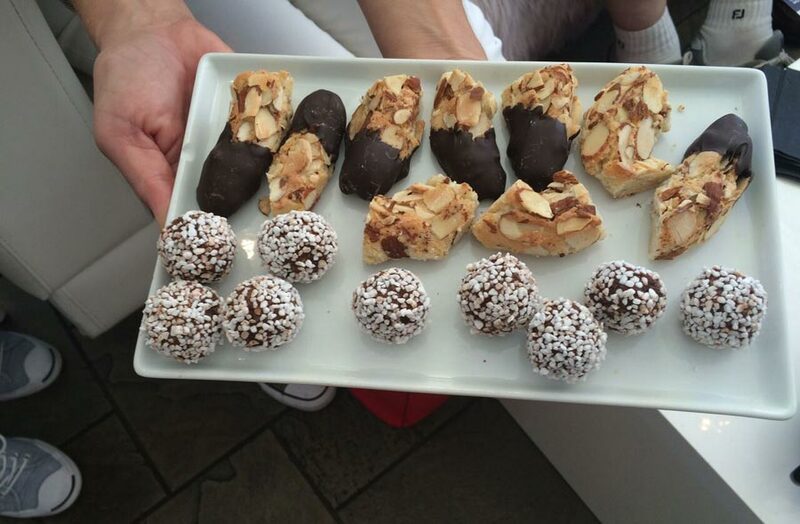 The coffee and introductions are self-explanatory, but what about fika? Fika (pronounced fee’ – ka) is a Swedish coffee break, where friends and colleagues take a true break where they don’t talk about work. They might nosh on something like what we enjoyed – an almond-flavoured horseshoe, and a chocolate ball made from espresso. I wasn’t sure about eating sweets so early in the morning, but I needn’t have worried. They were both as light as a feather and not overly sweet. We were well fortified to begin our walk. 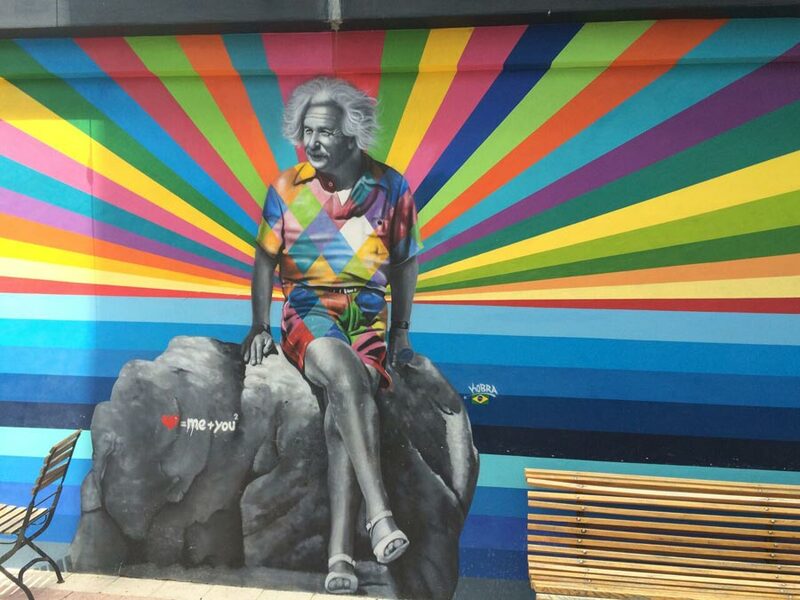 And Eduardo Kobra painted the unforgettable “Einstein’s Theory of Love” in his signature style, black and white with a splash of colour. Chef Fritz Cassel of gastropub Hullabaloo once had the distinction of cooking with chef Emeril Lagasse. On the tour, Cassel served us two signature dishes that he prepared with Emeril. We started with a delicious chicken meatball with homemade ricotta. But the star of the menu, and my favourite bite of the day, was the serving of fire-roasted Brussels sprouts with bacon aioli and candied pine nuts. The sprouts are cooked in an 800-degree pizza oven to get the crispiest surface possible. Even if you think you don’t like Brussels sprouts, promise me you’ll give this dish a try – you’ll think about sprouts in a whole new way. So many New Yorkers spend the winter in West Palm Beach, some call it the sixth borough of New York. So it makes sense that one of the most popular restaurants in town is Pizza Girls, which is known for its New York style pizza. Owners Phoebe and Jen opened the restaurant nearly 20 years ago, with no background in professional cooking. They make small changes to the dough recipe depending on the weather, and it seems to work perfectly – on this extremely warm day, the pizza crust was crispy on the outside, chewy on the inside, and a perfect foil for the vegetable toppings. Next on our list was Pistache, where the broccolini was so good, I came back for dinner. (Added bonus: being on the food tour meant I got a gift certificate for a free glass of wine with dinner.) And we all loved Blind Monk, which was named one of the top 25 wine bars in the U.S. by Travel and Leisure magazine. The name comes from monk Dom Perignon (did you know he was a monk? I didn’t!) who advocated blind tastings. The bar serves tapas with a Latin American influence. After sampling the Cuban Mohito and their take on a Cuban sandwich, I was smitten. At Ganache Bakery Café, owner Jamal Lake showed us how to open a coconut with a machete, then served us coconut water. 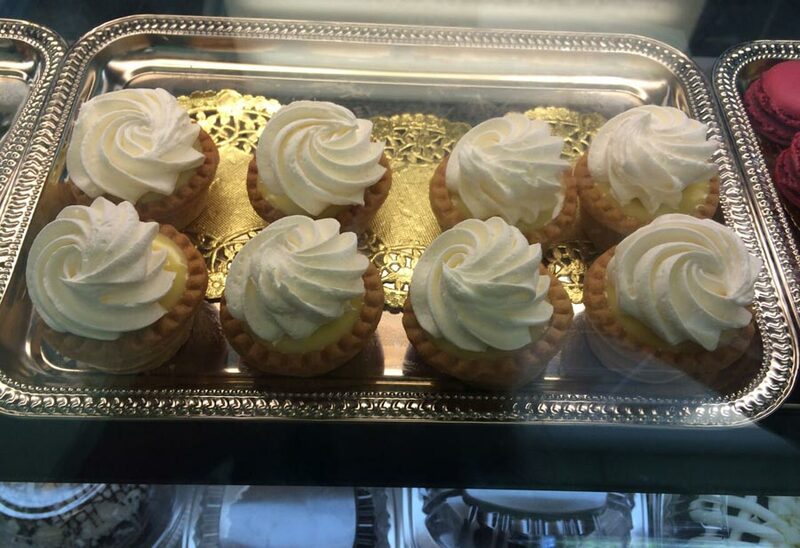 The heavenly Key Lime Pie tartlets that followed were different from the traditional recipe in two ways – they were baked in a shortbread crust rather than graham crackers, and they were topped with whipping cream rather than meringue. 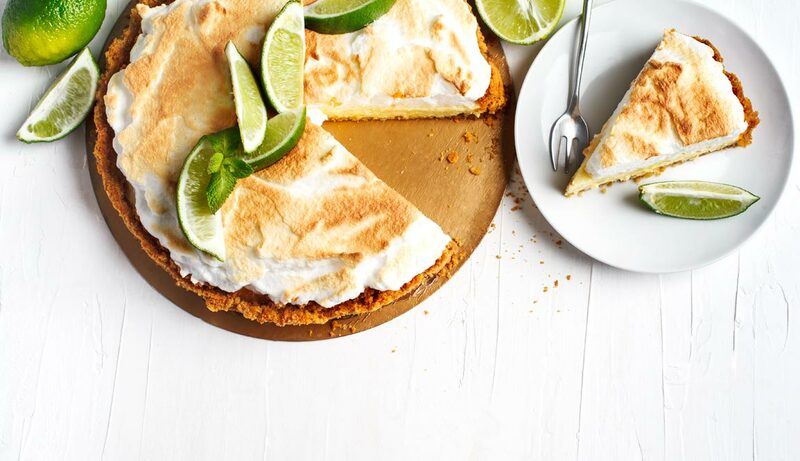 I’ve always insisted that the only way to serve key lime pie is with meringue, but having tasted Jamal’s variation, I’m willing to admit that a whipped cream topping is pretty amazing too. So I bought two bottles of Nellie and Joe’s key lime juice and brought them home with me. While they bulked up my suitcase for the rest of the trip, I celebrated my return by making a delightfully puckery pie. So I’m going to leave you with my recipe for Key Lime Pie – the recipe that my mom brought back on a postcard when our family visited Florida in the 1970s, and that she and I baked together many times over the years. When I got back home, my youngest daughter and I made a pie with Nellie and Joe’s key lime juice, and it was perfect. I did my own blind tasting: with my eyes closed, it took me back to a warm day in West Palm Beach, surrounded by people who loved food, and a tour guide who made the city come alive through its flavours. And don’t tell anyone, but next time I might just top it with whipped cream. To make the pie shell, combine crumbs, butter and sugar, and pat them into a 9” pie dish. Chill in fridge at least 10 minutes before adding filling. To make meringue topping, beat egg whites, adding cream of tartar and sugar, until stiff. Cover pie with meringue and place under the broiler until browned. 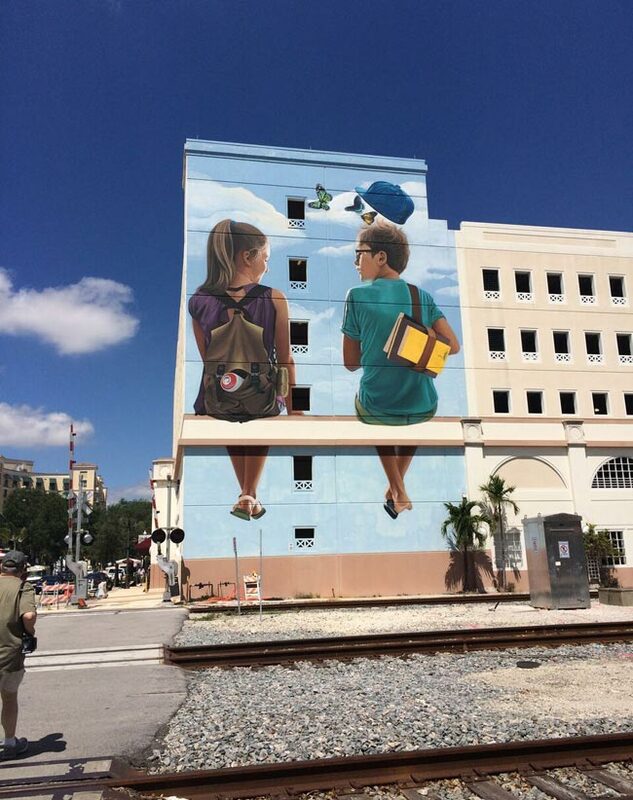 The author toured West Palm Beach as a guest of Discover the Palm Beaches, who did not review or approve this story.